Located near Middle River, Baltimore County, Maryland, Lighthouse Senior Living at Hopkins Creek reflects the look and feel of Maryland’s Chesapeake Bay and its tributaries. Offering a welcoming community for seniors on Baltimore’s East Side, Hopkins Creek serves the communities of Essex, Middle River and Bowley’s Quarters. Our caring staff and a close-knit community brighten the lives of residents and their families. Lighthouse Senior Living in Hopkins Creek reflects our commitment to exceptional care with a personal touch. Our staff members are devoted to our residents’ wellbeing. Well-appointed rooms and public areas, a full complement of amenities and a rich calendar of events add up to a uniquely bright approach to senior living—for residents and families. Our apartment homes offer abundant natural light and two-floor plans to suit your preference. Each is designed to accommodate your favorite furnishings, so you can bring a familiar touch of home with you. You’ll find your residence easy to move throughout, including easily accessible bathrooms, step-in showers and a 24-hour emergency response system to ensure your safety. All apartments include a kitchenette with a refrigerator as well as many other amenities. We also have the flexibility to offer alternative housing plans for residents in special circumstances, such as those requiring a short-term stay or housing for a second person. Our community is comfortable and inviting. A warm living area with a fireplace and plush seating welcomes visitors. This favorite resident area is a community hub where you, your neighbors and family can visit and chat, read a book from our library or just enjoy the fire! The family room features a flat screen television and computer, a game table, and an area for everyone to spread out and relax, including a special corner for grandchildren. Lighthouse boasts lush outdoor spaces for you to enjoy, too. Take a stroll through the garden courtyard or just sit and take in the view from the veranda. The community bistro is a favorite gathering spot for residents. Here, residents and their guests can enjoy pastries, fruit and beverages. Lighthouse Senior Living in Hopkins Creek provides three nutritious meals each day in the bright and cheery dining room. Residents always linger after their meals to enjoy the comfortable environment and easy camaraderie with their friends. A separate dining room is also available for private celebrations and occasions with families. In spring, Residents enjoy the blossoming of the gardens in our exterior courtyard. Outfitted with benches and chairs, the gardens are perfect for sitting, strolling and exercise. We also have front porch seating. 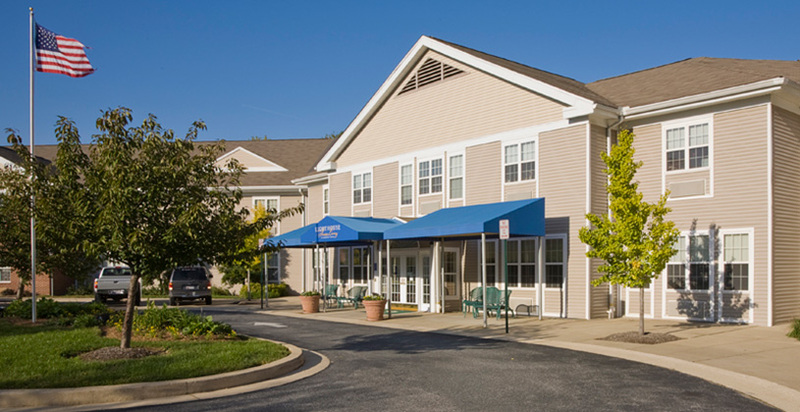 Travel to and from Lighthouse Senior Living at Hopkins Creek is made easy by proximity to the MARC train, I-695, I-95, Route 40 and Baltimore/Washington International Thurgood Marshall Airport. The Essex area of Baltimore County is also close to numerous parks, restaurants, shopping malls and world-class healthcare facilities including the Johns Hopkins Hospital and Johns Hopkins Bayview Medical Center. See a sample of what’s cooking at Lighthouse Senior Living in Hopkins Creek! Find out what’s happening at Lighthouse Senior Living in Hopkins Creek! Like what you see? Contact us today to schedule a tour or download a brochure. Weekly Open House at Hopkins Creek!